The calendar tells us that it’s winter and with that (usually) comes cold temperatures, causing many Vermonters to transition their exercise from local bike paths and hiking trails to indoor gyms. Indoor training is great, especially for those Vermonters who are sensitive to colder temperatures, or are at risk for falling and do not want to venture out on icy roads or trails. However, quickly changing from soft exercise surfaces such as grass and packed trails to hardwood or concrete can cause injuries in the lower legs. Of these injuries, shin splints is one of the most prevalent diagnoses. Shin splints most commonly occur when a muscle called the posterior tibialis is put under more stress than the muscle is used to. 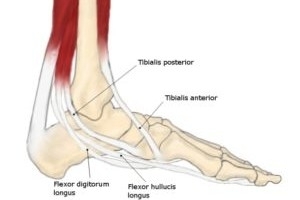 The posterior tibialis muscle runs right next to the shin bone, and often when people feel “shin pain” it’s really the muscle that is aching. Plantar Fasciitis is another painful lower body injury that affects the bottom of the foot. The fascia on the bottom of the foot (check out one of our previous blogs to learn about fascia), can become inflamed and painful. Last, transitioning from soft to hard surfaces can cause a stress fracture. A stress fracture occurs when the bones of the lower body undergo so much impact that one or more weaken and may potentially “crack” like any other fracture. When an athlete runs on a soft surface, such as grass or dirt, the surface helps to absorb some of the force that is put on the leg – as though the person is running on a cushion. However, most treadmills and gym floors are hard and rigid, offering no shock absorption and much more force is applied to the lower leg. This stress can cause a bony injury. Wear appropriate footwear. Most recommendations suggest that shoes should be replaced at least every 500 miles, or every 9 months. Also, it is important that a person’s shoe match the needs of the person’s foot. Athletes with flat feet often need more stability in a shoe, while athletes with high arches generally require more cushioning. Eat well and hydrate. Muscles cannot recover if they are dehydrated – so drinking plenty of water helps contribute to overall muscle health! Also, checking with a doctor or licensed dietician is a great idea to make sure that an athlete is getting enough vitamins and nutrients – such as vitamin D and calcium, which contribute to healthy bones and joints. Don’t do too much too soon. Ease into indoor workouts. Start by trading an afternoon trail run once or twice per week for one on an indoor track or treadmill. Mix some non-weightbearing activities into exercise routines. As athletes transition to indoor activities, it is important to give their bodies a break from high-impact exercise such as running, jumping, and/or competitive sports. Spinning classes, swimming, and upper body workouts are all great ways to exercise without risking an injury to the lower legs. Last, but certainly not least, if an overuse injury arises, seek out help before the pain escalates. Physical therapy is a great tool to keeping everyone healthy and active!